An emergency warning was reissued on Sunday for an out-of-control bushfire that is raging across parts of the Australian city of Sydney. SYDNEY • More than 500 firefighters, dozens of fire trucks and 15 aircraft battled a major bush fire south-west of Sydney yesterday to try to protect scores of homes threatened by the blaze. Australian Broadcasting Corporation (ABC) reported online that some homes had been affected. It said the New South Wales (NSW) Rural Fire Service (RFS) could not immediately confirm the level of damage. But the fire service said the blaze had burned about 2,500ha around Holsworthy and Menai, with other nearby areas also under threat. Fire conditions eased later in the day, allowing firefighters to step up efforts to bring the blaze under control. The intensity of the blaze, fuelled by unseasonably hot weather and high winds, had alarmed firefighters. The BBC quoted RFS Commissioner Shane Fitzsimmons as saying the fire was behaving "very aggressively". The strong winds have been pushing the flames north and east towards suburban areas, with fire crews using water-bombing planes to try to tame the fire front. Prime Minister Malcolm Turnbull praised the emergency response. "It is unseasonably hot and that's a matter of obviously great concern, but we have to deal with the worst that Mother Nature can throw at us, and the worse Australians are presented with by nature, the better it brings out the Australian spirit," he said. 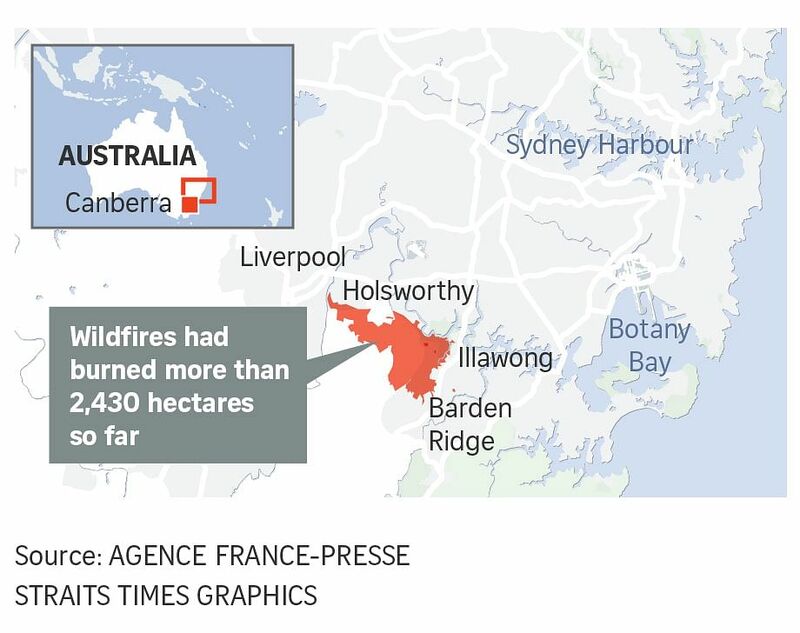 2,500 Area in hectares around Holsworthy and Menai that was burned in the blaze, with other nearby areas also under threat. NSW Police have launched an investigation into the cause of the fire and are appealing for witnesses, ABC reported. Mr Fitzsimmons said the hot weather was sucking "the moisture out of the vegetation", making it highly susceptible to catching fire. "It will be a tough week for firefighters because unfortunately, what we really need is a meaningful rain right across this fire ground and right across other parts of NSW," he said. More than 200 people visited an emergency centre at Moorebank Sports Club overnight, with local hotels offering accommodation to residents unable to return to their homes, ABC said. Liverpool Council chief executive Kiersten Fishburn said locals came together to help. "I've seen people offer their houses, their beds, to babysit kids, to look after injured reptiles. Anything the community needs, people have offered up their hands to deliver it," she said. Local businesses also donated food and water to the firefighters, ABC said.